We are working on finding out more about the 1969 Mustang 4.1 Liter Special which came with an automatic L-code 4.1 liter (250ci) 6-cylinder engine; special order exterior green WT7034, yellow or orange paint; white and gold pinstripe; and a 4.1 Litre Special checkered flag fender badge. The special model seems to be local to the Indianapolis order district (DSO 46). Here is a rare one! 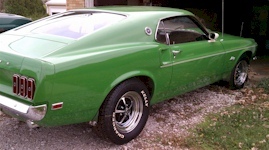 It's a 1969 Mustang 4.1 Liter Special Edition fastback. It's owned by Don Shelton from Indianapolis, Indiana. Don's Dad bought this car new at Roberts Ford in Danville, Indiana back in 1969. The car has not been restored and looks the same as it did back in 1969. The 4.1 Liter Special was local to the Indianapolis area. The limited edition came in three different colors (special order exterior green WT7034, yellow or orange) with white and gold pinstripes. They also had the L-code 4.1 liter (250ci) 6-cylinder engine and automatic transmission. Don confirms that his 4.1 Liter Special has the 6-cylinder engine, white and gold pin stripes, special order (blank paint code) green paint, automatic transmission, #0572 Indianapolis ordering district as well as other unique options - white racing mirrors, non-functional hood scoop, and side scoops. Don says that this car never had the 4.1 Litre Special checkered flag fender badges rumored to be on them - but he did say that his Dad bought it right off the Delivery Truck. Maybe the dealer didn't have time to prep it and install the emblems. Don had read an article on another original owner of a 1.4 Liter Special who says that his had a red emblem that said "4.1" then a black bar below it that said "Litre Special". This is a 4.1 Liter Special 1969 Mustang fastback. These came originally with the 250ci/4.1L 6-cylinder engine. This Mustang wears Special Paint Orange paint WT5108 as identified by a paint chip sent to Marti Auto Works. The paint code on the data plate is blank. It has the code 2A black vinyl standard bucket seats, code 6 3.00 conventional rear axle, and the code 1 three-speed manual transmission. It has the order number of 460574 for the Indianapolis Ordering District. It was scheduled to be built on May 5, 1969 (May 26 actual) and delivered to Jordan Motors Inc. from Mishawaka Indiana. Other options included: Sports Appearance Group with Tape Stripe, E78x14 Wide Oval White Sidewall Tires, AM Radio, and Wheel Covers.